TamilNet: 24.10.03 SLFP demonstrates against "betrayal of Sinhala nation"
SLFP demonstrates against "betrayal of Sinhala nation"
Thousands of people participated in the demonstration organized by the main constituent of the opposition People’s Alliance, the Sri Lanka Freedom Party (SLFP), against the United National Front (UNF) government of Sri Lanka Friday in Colombo, saying the UNF has 'betrayed' the 'Sinhala nation,' sources said. Demonstrations began from five corners of the city at Sugathathasa Stadium, Chandra de Silva Stadium, Henry Pedris Stadium, Campbell Park and Bandaranaike Memorial International Conference Hall venue at about one p.m. and concluded around five p.m., the sources said. 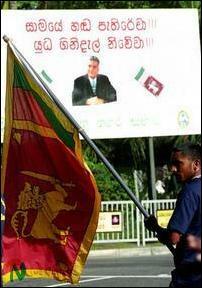 Party cadre carrying the National flag in front of a cutout of the Prime Minister, Ranil Wickremasinghe, promoting peace, at the Liberty Plaza juntion in Kollupitiya. 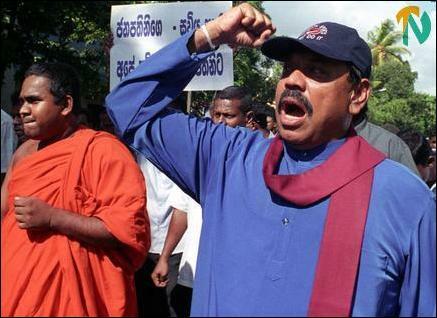 Leader of the Opposition, Mr.Mahinda Rajapaksa, Parliamentarians Mr.Anura Bandaranaike, General Anuruddha Ratwatte, who was charged in the Udathalawinna massacre of eight Muslim youths and is out on bail, Mr. Mangala Samaraweera and several leading members of the SLFP were seen leading the demonstrations. 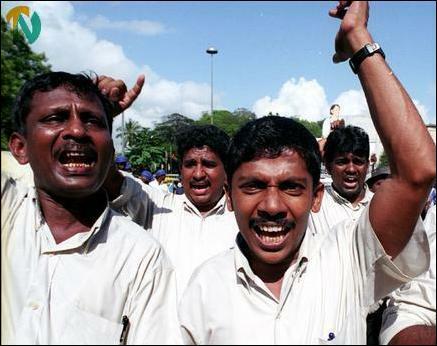 Several demonstrators shouted slogans and carried banners and placards blaming the UNF government for signing a ceasefire agreement with the Liberation Tigers of Tamil Eelam (LTTE), which they said was a 'betrayal of the Sinhala nation,' sources said. PA media spokesman and parliamentarian, Dr.Sarath Amunugama, said that the demonstration had been organized by the country's 'alternative' government. SLFP' General Secretary, Mr.Maithiripala Sirisena, said the party expected one million people in the demonstration. Independent observers, however, estimated about one hundred thousand people participated in the demonstrations. More police and army soldiers were deployed to maintain law and order in the city when demonstrations were proceeding towards the CMC grounds. The public meeting was in progress from 5 p.m. at CMC grounds, media sources said. Party cadres shouting slogans and marching.